Fairland’s Senior Center is open on Thursdays inside the new Fire Station. Carey Street (400 North/Fairland Road.) Hours: 9:00 a.m. – 3 p.m. You are always welcome to “stay and play” after any program! April 4th: First Thursday Euchre! 12:00 p.m. Lunch: Ham & Beans, Cornbread or Turkey Sandwich, cole slaw and dessert. 1:00 p.m. Euchre tournament; prizes for high and low Scores. April 11th: How Are We Doing?? 12:00 p.m. Lunch: provided by Major Health Partners; baked spaghetti, salad, garlic bread & dessert. 1:00 p.m. The new Major Health Partners Medical Center has been open for nearly two years and they want to hear from you! Join Josh Georgen and Janie Schuster from the Patient Experience Department at MHP for a patient feedback roundtable. It is important to MHP to hear your thoughts and opinions on your healthcare experiences! Advisory Board following MHP Forum. 12:00 p.m. sloppy joes, potato salad, veggies and dessert. 1:00 p.m. Jeff Owens is a retired firefighter/paramedic from Indianapolis and also a singer/songwriter. His songs are about real life… the beautiful and the ugly… and how God has brought him through it. Jeff also is the leader of The Kasey Program, a program that teaches children fire & life safety skills by using Kasey, a black Labrador retriever, to perform skills like stop, drop & roll, checking the door to see if it’s hot, knowing two ways out, etc. The Kasey Program is the only full-time, nationally touring fire prevention program in the country. 12:00 p.m. Lunch: tuna casserole, broccoli salad and dessert. 1:00 p.m. A Dementia Friend learns a little bit more about what it’s like to live with dementia and then turns that understanding into action – anyone of any age can be a Dementia Friend Crystala‘ Evans, activities director from the Horizon Center, will help us learn more about dementia and the small ways we can help. From telling friends about Dementia Friends to visiting someone we know living with dementia, every action counts. This is an important hour for all of us! Reservations must be made to have lunch. Meal orders due by Monday evening. Sign up at the center on Thursdays or call Kathy Miller, center coordinator, 317-398-4817. Cost: $4.00…new price for a New Year. 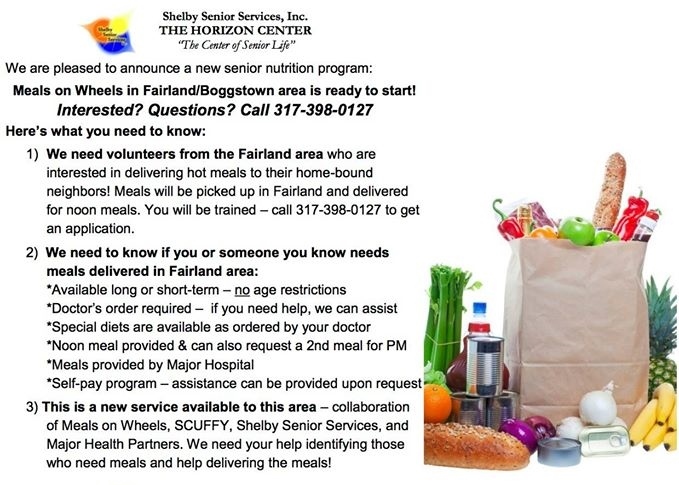 A very important Volunteer component for our Meals on Wheels program serving the Fairland area is transporting the meals from MHP to the pick-up location in Fairland! This takes approximately 30 minutes – the folks on both ends are simply a delight and it is a wonderful volunteer opportunity for those with little free time but willing to serve the community!! Pick up hot and cold container from MHP Cafeteria at 10:30 a.m.
Transport to Fairland Town Hall (old fire station). Turn towards Triton Schools off Fairland road, past Sutherlands, turn left on Washington. At stop sign turn right (never crossing railroad tracks). Town Hall is on the left – Linda and driver will meet you. Unload into their containers. Return containers to MHP unless driving route the following day. Meals are delivered Monday-Friday. You can sign up for one day per month, one day per week, whatever fits your schedule!! Contact Buffy Powers if you are interested in volunteering at 317-398-0127.